* or by sending your vote by email to scarletleafpublishinghouse@gmail.com. Bio: Robin Wyatt Dunn lives in a state of desperation engineered by late capitalism, within which his mind is a mere subset of a much larger hallucination wherein men are machines, machines are men, and the world and everything in it are mere dreams whose eddies and currents poets can channel briefly but cannot control. Perhaps it goes without saying that he lives in Los Angeles. I was born in Wyoming in 1979, so I’m 37. I’ve had about one address for every year of my life. Favorite cities I’ve lived in include Los Angeles, California, Austin, Texas, Bronx, New York, and Oxford, England. I was fortunate to be a public school student in Texas as a kid when the state was still investing a lot of its oil money in public schools, so I actually had a PhD teach me third grade math. But I always liked learning so I didn’t need much encouragement. I got my BA from Fordham University where they had a great honors program with an old fashioned ‘great books’ curriculum: read tons of literature, history, philosophy and art of the ancient, medieval, early modern and modern worlds. It would be great to make some money but the kind of things I most enjoy writing don’t seem to have enormous commercial appeal. Money aside, I’d like to develop my poetry so that it is more transformative; so that it can do things I don’t quite have the words for now. I’d like to improve my prose too; I don’t know quite how. Walt Whitman is like a nuclear bomb; the blast sort of clears out your mind of vegetation so you can see the world like he does, immense. Emily Dickenson is like a spelunker; dragging you down into terrifying caves. E.E. Cummings I read very young and was always amazed at what he did; I didn’t know you could do that with poetry. Keats writes love better than anybody else. Ginsberg is like a good sergeant, showing you where to march, and not letting you stop. T.S. Eliot is a dreamer, like me. And I always liked his nightmarish landscapes, and how they intersected with the “normal” world. Forthcoming, Black Dove, a novel. Forthcoming, November 4, 2016, City, Psychonaut. Forthcoming, September 10, 2016, Colonel Stierlitz, a novella. Forthcoming, August 25, 2016, White Man Book. December 30, 2015, Conquistador of the Night Lands. December 7, 2015, Poems from the War, narrative poetry. October 1, 2015, Julia, Skydaughter, a novella. June 5, 2015, Last Freedom, a collection of short plays. December 30, 2014, A Map of Kex's Face. June 5, 2014, Fighting Down into the Kingdom of Dreams. March 7, 2014, Line to Night Island, a novella. August 28, 2013, My Name is Dee. December 29, 2011, Los Angeles, or American Pharaohs. April 24, 2016, Koreatown. Gypsy Daughter. April 22, 2016, Mary. Rinky Dink Press. December 30, 2015, Hanblečeya. White Knuckle Press. January 20, 2015, Be Closer for my Burn. Crisis Chronicles Press. October 21, 2014, Telegrams from X County. White Knuckle Press. August 31, 2014, A Picnic in England. Gypsy Daughter. November 13, 2013, Drive Thru Poems. White Knuckle Press. I am working (slowly!) on a story about a man living in London who spends much of his time in a simulated version of his city. In the simulated version, war has destroyed the city and he lives in apartment he cannot leave, because of the fires and pollution. He is a scientist, trying to find out the connection between waking life and dreams. They’re a mix of literary, science fiction, magical realism. But I just write whatever I find fun! I’ve always written poetry. But I didn’t start writing books until after the Wall Street crash of 2008. Like many people I had a hard time of it, and books, for me, have been some of the best therapy. Language infiltrates as well as reflects reality; we are always in a feedback loop with the world but language, and its precise control, gives us more influence over the world. Writing allows us to control our own destiny, as well as giving us a fuller understanding of all those areas of our lives over which we will never have any control at all. I teach much of the year and write most summers. I do manage to write at other times too. I wrote a great deal when I was an MFA student but all good things come to an end! Like many writers, especially with poems and short stories, I am trying to capture a specific feeling, often one I experience when listening to music. Novels are about feelings too, but more about ideas, for me, and trying to work them out on a large scale. I really have no idea; I think I’ve gotten better and others seem to agree with that. So cheers to me! I’ve never had a serious case of it but minor cases I’ve had I’ve often managed to beat simply through self-discipline, like going to work even when it’s the last thing you want to do. I do prefer physical books. Reading many pages on a screen makes me tired, and I like turning pages. Some of my favorite writers are Gene Wolfe, Peter Hoeg, Sheri S Tepper, James Joyce, William Faulkner, China Mieville, Bruce Sterling, William Gibson, Nicole Krauss, Michael Chabon. I am very fond of Sir Gawain and the Green Knight, whoever its medieval author may have been, as well as The Epic of Gilgamesh. I am reading The Elephant Keeper’s Children, by Peter Hoeg. I do proofread all of them myself. Getting someone else to help is great, which I have done with books I have published in the small press. A good editor is worth twice their weight in salt! Sometimes I will let the book stew mid-writing. But once I finish it I tend to try to edit it quickly. I am very fortunate to work with Barbara Sobczyńska, who I met through the web site Deviant Art. She is a very talented artist living in Krakow. Absolutely. We all judge books by their covers! Publishers Weekly, LibraryThing, Foreword Reviews, Goodreads, as well as our old friend Google, for hunting down reviewers. I would if I could afford it! Very little! Submitting already takes a fair amount of time. Yes, especially when you’re an unknown. People don’t often buy books by people they’ve never heard of, and if you have no reviews on the web. In addition to describing a beautiful near-apocalypse landscape (the sun is dying), these books pose powerful moral questions about the nature of violence and our understanding of heroism in relation to violence. Lots of it will become stupider and more garish. At the same time, I believe an opposing movement will gain steam, of intelligent books for intelligent people, with improved distribution. We want to thank you for taking the time to visit our magazine and read the awesome literary pieces featured every month. 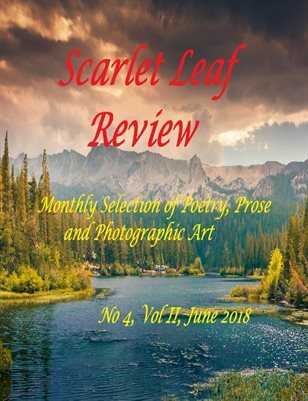 Scarlet Leaf Review recorded 295,517 hits during the period Jan 15, 2016 and Sep 21, 2016, while for the August issue (Aug 15-Sep 14) had 44,937 readers. For the September issue, we had the pleasure to see 17,490 readers on the site for a very short period, Sep 15 – Sep 21. We thank all the authors that chose to publish with us. The success of this review relies on them, their talent and their hard work. We thank them all and we congratulate them! I grew up mostly in Montreal by the St. Lawrence River. My parents were both journalists, and my father and mother moved my brother and I to Spain when we were young so my father could write a mystery novel. My father read often, his favorite was Shakespeare, who he would read to us over the dinner table. My mother and I would write short stories together. She was the first person I shared my poems with. In 1995 my book Somewhere Falling was published by Beach Holme Publishers, a Porcepic Book, in Vancouver in 1995. Since then I have published twelve other books of poetry and seven collections with Edge Unlimited Publishing. Before the publication of Somewhere Falling I had a poetry book published, Common Dream, and four chapbooks published by The Plowman. My poetry chapbook The River is Blind was published by Ottawa publisher above/ground press December 2012. In 2014 my chapbook Surrogate Dharma was published by Kind of a Hurricane Press, Barometric Pressures Author Series. Then in 2015, my book No Raft – No Ocean was published by Scars Publications. More recently, my book Make the Wind was published in 2016 by Scars Publications. As well, my book Trial and Witness – selected poems, was published in 2016 by Creative Talents Unleashed (CTU Publishing Group). I am not working on anything right now. I am in a bit of a stasis right now. I am just writing poems or pieces of poems. I write longhand with a pen and tuck the paper in a drawer. I have about six months of writing, which I will eventually type in, and most of it I will throw out. I am not sure if any of it will amount to anything at this point. I never decided to be a writer/poet. It was actually one of the last things I wanted to be. For me, it wasn’t a choice, but an acceptance, which at almost 50 years old, I have mostly come to terms with. When and how I write has changed over the years. I use to write in donut shops, then when walking. The early mornings have always been the most sacred and creative times for me. I am a full-time poet, because for me being a poet isn’t a career or job, it is just part of who I am, something I carry with me always. My inspiration comes from animals, children, people, trees, love, inner dread, spiritual longing – all of it ultimately, if it is worth anything, comes from God. I don’t know, because it seems to always be evolving or changing. There are times when I feel very confident with creating and other times I feel like an amateur with no ability whatsoever. Writing poetry for me is not an intellectual endeavor and it is not purely emotional either. Those aspects are involved, but only secondary. It has always been for me an act of surrender - clearing myself to receive, trusting what I receive, and then recording it. I proof read and edit all of my writing many times over. When I feel done, my husband Kyp Harness, singer/songwriter, author, and cartoonist reads it over, whose artist opinion I trust implicitly. The first nine books I put out in 2012 were very clear visions I had for fifteen years before putting them out. I knew I wanted my sculptures on the covers and I knew which one I wanted on which book. The books I self-published since then were the same. They have all of my work in them that I want to share. I wouldn’t do it any other way. I like self-publishing books with createspace as it gives me absolutely control over the look and content, as well as any changes I want to make at a later date. I also love that I can do it at my own pace, which is usually very quick. I have been published by publishers and often (not always) I have been at the mercy of their time-frame. The first book I got published took two years from when I started sending it out – a year to be accepted and another year before it was in print. The main drawback with self-publishing is that a larger publisher has the machinery in place to promote the book, get reviews and interviews which is lacking when self-publishing. As well, having a book published by an established publisher gives the author respect and credibility. Q: Which famous persons, living or dead would you like to meet and why? Jesus, first, although he is alive now and I have met him. Dostoyevsky, second, because he is my mentor. Jane Goodall, third, because she is my hero.